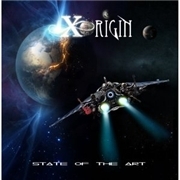 XORIGIN? And a space opera cover at that, who are they and why do they even bother? Well, their first band name was actually ORANGE CRUSH, which makes anything else a major improvement, and the men behind the moniker are Norwegian session singer Johannes Stole and Daniel Palmqvist of MURDER OF MY SWEET. To put more emphasis on the possibilities of the band I might add that drums and production are handled by Daniel Flores (MURDER OF MY SWEET, and almost everyone else). Hey-ho, let´s go! The spaced out intro part of opener “Can´t Keep Running” reveals nothing of what´s to come. But as openers go, it is a wise choice and the best track on offer. The rest of the album dips between ok and above average. The competition is fierce and they could have used more songs like the opener and the slightly more rocking “What Love Is All About”. The old-fashioned style is an advantage in the genre, but the copy-cat mentality is too evident at times. Perhaps more of the promised modern edge that the info sheet mentions would have done the trick. There is absolutely nothing to complain about concerning the performance. With these well-trained musicians I expect nothing else. But the material is not gripping enough, or touching to qualify alongside TOBY HITCHCOOK´s debut as one of the best debuts of 2011. But there is still a promise in here for the future, but they need to rethink their position I believe.